Buried: Rookwood RC Cemetery. Freeman St, Rookwood. About 4pm on 2 November, 1911 the sergeant was on duty carrying out inspections of pawn shops. At the intersection of Campbell and Castlereagh Streets he failed to hear a tram coming in his direction (he was suffering from diminished hearing) and he was struck by the tram and knocked to the roadway. He was quickly conveyed to the Sydney Hospital suffering from a fractured skull and other head injuries; however he passed away the following day. The Evening News of 3 November, 1911 carried quite a lengthy report of the tragedy. Sergeant George Jeffes died in Sydney Hospital early this morning as the result of a city tram accident. He was on duty delivering pawn slips and inspecting pawn shops in the No. 2 (Regent-street) Police District yesterday afternoon, and while crossing Castlereagh-street, at the corner of Campbell-street, he was knocked down by tram No.81 proceeding from the railway station to Circular Quay. Senior-constable Young spoke to Jeffes at the corner of Campbell and Liverpool streets, and a few seconds later on seeing a crowd collect he went to the scene and found his comrade badly injured. He secured the Civil Ambulance, which conveyed the injured man to the hospital where he was admitted with a fractured skull. He was operated on and a lot of blood removed from his brain, but he never rallied. He will be given a police funeral tomorrow afternoon, the cortege leaving the corner of Elsternwick-street and Allen-street, Leichhardt at 1.30 p.m. for Rookwood Cemetery. Sergeant Jeffes, who was 58 years of age, was an Englishman, and served as a bluejacket till 1882, when he came to Australia, and joined the New South Wales force. He was made a first class constable in 1885, senior-constable in 1889, and sergeant in 1895. He had thus 30 years’ service and could have retired two months ago, taking six months’ leave, but being still strong, he was, at his own desire, allowed to continue in harness, and was working in plain clothes on light duty among the pawn shops. ” THE GOOD SHEPHERD. ” Sergeant Jeffes was for many years known as, the good shepherd, and he did great work reclaiming white girls from the Chinese dens, and children from the slums and from parental hurt to their care. He was associated with Mr. Sherwood in the famous Botany poisoning case, in 1888, when Louisa Collins was hanged. With regard to the death of the sergeant’s daughter, the Evening News of 3 July, 1909 reported that “Miss Kate Jeffes, 21, the young woman who was shot in the arm and breast by a French Canadian, named Felix Perrier, in George-street on the night of June 21, died at the Sydney Hospital at 3.30 this morning from the effects of the wounds, accentuated by the shock. She was the daughter of Sergeant Jeffes, of No. 2 Police Station”. 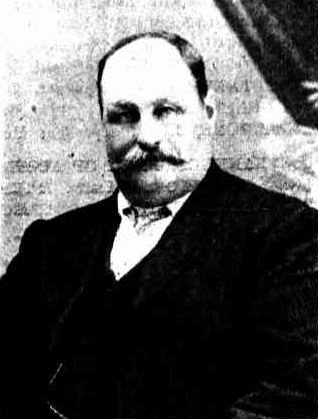 The sergeant was born about 1853 and joined the New South Wales Police Force in 1882. At the time of his death he was stationed at Regent Street Police Station. 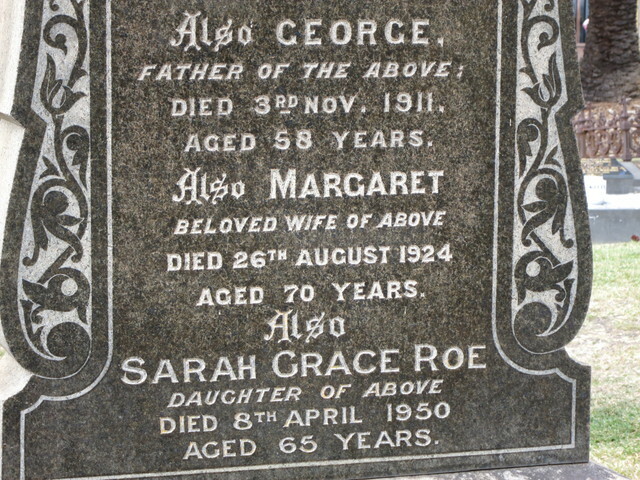 He is buried at Rookwood Cemetery. inquiry Into the death of Sergeant George Jeffes, who was knocked down by a tram at the intersection of Castlereagh and Campbell streets, on Thursday afternoon last. Evidence was tendered to the effect that the deceased was crossing the street at the intersection of Castlereagh and Campbell streets at about 4 pm. As the car approached, a witness called out to him, and the driver sounded the gong, cut off the current, and applied the emergency brake. The car moved on a couple of yards after striking deceased, who was carried along by the cow-catcher. Deceased’s hearing, it was stated, had been defective of late. The Coroner found that death had resulted from injuries accidentally received through being knocked over by a tram. The ” Good Shepherd. ” A RESPECTED MEMBER OF THE SYDNEY POLICE FORCE. As the result of a tram accident on Thursday afternoon last, the death occurred on Friday of a well-known figure in the Sydney police force, and a much-respected and admired officer – Sergeant George Jeffes, at the age of 58 years. Born at Northwich, Cheshire, young Jeffes was apprenticed to the ironworking trade, beginning work when but 8 years of age, in a foundry in Salford, Manchester. At 15 he was seized with the adventurous spirit, and ran away to sea, completing a term of service in the Imperial Navy. Returning to Salford, he joined the fire brigade, and in this capacity had his first experience as a police officer, for in those days the fire-fighter did dual duty. Soon he was again seized by the wanderlust, and landed in Victoria in 1879. A year later Mr. Jeffes arrived in New South Wales, shortly afterwards joining the police. He was first stationed at Darlinghurst, but subsequently was transferred to Botany, where he was instrumental in bringing to justice Louisa Collins, the last woman who suffered the extreme penalty of the law in New South Wales. In 1889, he was again stationed at Darlinghurst, and promoted to the rank of senior-constable. He was next promoted to Sergeant, when, in 1896, he was attached to Regent-street Police Station, where he ended his career. To a large extent the suppression of opium traffic, rampant in Sydney a few years back, was the work of Sergeant Jeffes, who, while engaged in this duty, was responsible for saving countless unfortunate women from infamy, earning for himself the sobriquet of the ” Good Shepherd ” for the splendid success attending his efforts. Although stern with Chinese law-breakers, Sergeant Jeffes had the confidence of the whole Chinese quarter. He was regarded in the slums as one whose inclination was more to assist that portion of humanity generally regarded as homeless, than to treat them with the harshness which is generally their lot. His knowledge of the back streets and the opium trade was vast ; and Sergeant Jeffes could always openly enter houses and places that might prove dangerous indeed to any other officer. His untimely death is greatly deplored in the police force, and by many whom he succeeded in setting on the right path again. The later Sergeant Jeffes was a staunch and practical Catholic, and a member of the Sacred Heart Confraternity. He leaves a widow and two children — a daughter and a son. The Rev. Father Darby was in attendance at the last, and administered spiritual consolation. A YOUNG WOMAN SHOT. SUICIDE OF HER ASSAILANT. A sensational shooting affray took place in George-street, near Goulburn-street, city, about half-past 9 o’clock on Monday night, during which Kate Jeffes, 21, a daughter of Sergeant Jeffes, a well-known officer connected with the Regent-street Police Station, was wounded twice, while her assailant committed suicide. Some weeks ago, Miss Jeffes took a situation in a Pitt-street cafe, where Felix Perrier, a French-Canadian, 35 years of age, was employed as cook. Perrier, it appears, conceived a strong attachment for the young woman, but his attentions were not encouraged, although he occasionally accompanied her to the tram of an evening, at the close of the day’s work. Perrier became so persistent in his attentions that Miss Jeffes decided to leave, and she secured a situation in dining rooms in George-street. Eventually Perrier found out where she was employed, and called there on Monday, but she refused to see him, and he went away. On ceasing work a little after 9 o’clock, Miss Jeffes started for home, and on reaching the corner of George and Goulburn streets, saw Perrier on the footpath. He addressed her, but she refused to have anything to say to him, upon which the man drew a revolver, and at close quarters fired two shots at her. The first bullet penetrated the cartilage of the left arm and spent itself in a brown paper parcel, which contained her apron and a blouse, and which she was carrying under her arm at the time. The second bullet had a more serious effect striking her beneath the right breast. The bullet did not penetrate very deeply, however, but struck the breast-bone, which caused it to deflect, and travel around a rib under the left arm, eventually embedding itself in the back portion of her left side. She fell bleeding to the footpath, and Perrier, evidently believing that his second shot had taken fatal effect, placed the muzzle of the revolver in his own mouth, and fired. Naturally a crowd soon gathered, and Miss Jeffes was placed in a Cab, and taken to the Sydney Hospital. The Civil Ambulance was sent for and took Perrier to the Sydney Hospital, where life was pronounced extinct, and the body was conveyed to the Morgue, at Circular Quay. The bullet in Perrier’s case had entered at the mouth, and travelled upwards towards the brain. Dr. Parry extracted the bullet from Miss Jeffes’ side, and she was admitted to the hospital, where she is progressing satisfactorily, the wounds not being regarded as serious. A cook named Felix Perrier, 35, employed at the Glenrock Cafe, Pitt Street and residing at Druitt Street, City, created a sensation to night by attempting to murder Kate Jeffes, 21, daughter of Sergeant Jeffes, of the Metropolitan police, by shooting her with a revolver, and afterwards shooting himself. The affair took place in George Street, Perrier had been keeping company with Miss Jeffes, but she resented his intentions. To night when he met her in George Street near Druitt Street, he spoke to her and she refused to answer. He then drew a revolver and fired two shots. One bullet entered the young lady’s left arm and the other the side of the right breast. Neither wound is serious. Perrier then fired another shot and put an end to his own life. A DISAPPOINTED LOVER TRIES TO MURDER A YOUNG WOMAN. THEN BLOWS HIS BRAINS OUT. Felix Perrier, 35, lately living in Druitt-street, city, attempted to murder a young woman named Kate Jeffes, 21, in George-street, near Goulburn-street, at about 9.30 last night. He fired two shots at her at a range of less than a couple of feet, both of which took effect, and then put the muzzle of the revolver into his own mouth and blow his brains out. Perrier, who was apparently a foreigner, has been employed as a cook at a cafe in Pitt-street for some time, and the young woman, who is a daughter of Sergeant Jeffes, at the No. 2 police station, met him at the cafe some nine weeks ago, when she took a situation there as a waitress. Perrier conceived a strong affection for the young woman, but she refused to encourage him. She, however, occasionally allowed him to see her to the tram of a night when work was over. He eventually became so persistent in his attentions that the young woman was compelled to leave her situation at the cafe and seek employment elsewhere. She afterwards obtained work as a waitress at some dining rooms in George-street, and her troubles with Perrier ceased for a while. But he eventually found out where she was, and, yesterday afternoon, he called at the premises in George-street, and asked to be allowed to see her. Miss Jeffes refused to see him, and in order to be free of him, she asked one of the girls in the cafe to inform Perrier that she had left the place. Perrier, on receiving this information, took his departure. After work Miss Jeffes started for home shortly before 9.30, and was walking down George-street. On nearing Goulburn-street she noticed Perrier standing on the footpath. She tried to evade him, but he stepped up to her and said: “Good night.” The young woman turned her head away, and refused to speak to him, whereupon he drew a five-chambered Belgian revolver, and fired two shots point blank at her. The first bullet penetrated the cartilage of the left arm, and spent itself in a brown paper parcel, which contained her apron and a blouse, and which she was carrying under her arm at the time. The second bullet had a more serious affect, striking her beneath the right breast. The bullet did not penetrate very deeply, however, and luckily struck the breast-bone, which caused it to deflect and travel around a rib under the left arm, eventually embedding itself in the back portion of her left side. She fell bleeding to the footpath, and Perrier, evidently believing that his second shot had taken fatal effect, placed the muzzle of the revolver in his own mouth and fired. The shots had been fired at such short range that the sleeve of the young woman’s blouse was burned with powder, and powder marks were visible on the front of her dress. There were a number of people about, and a large crowd soon gathered. A woman named Eliza O’Connor, living in Francis street, Hyde Park, who was close by at the time, put Miss Jeffes in a cab, and took her to the hospital, while a traffic constable rang up the Civil Ambulance, which was speedily in attendance, and removed Perrier to the hospital, where Dr. Parry pronounced life extinct. The body was then removed to the Morgue. The bullet in Perrier’s case had entered at the mouth, and travelled upwards towards the brain. Dr. Parry extracted the bullet from Miss Jeffes’ side, and she was admitted to the hospital; where she made a statement to the police. Her injuries are not considered serious. The revolver which Perrier used was a Belgium make, and contained four cartridges, three of which had been discharged. Edward Crampton, a tobacconist, of 48 Druitt-street, who identified the body, and with whom Perrier had lately been living, stated that Perrier bought a revolver on Saturday last, and said that a young woman had been “pulling his leg.” His French blood would get the better of him,’ he said, and he would shoot her. The revolver was taken from him, together with a number of cartridges, but he appears to have regained possession of it. On the body were found Perrier’s discharge papers from the South African Light Horse, dated 1902. These show that he was a French Canadian by birth. Felix Perrier, who last night shot at Kate Jeffs and then committed suicide, was a French-Canadian and had served in the South African light horse. Edward Crampton, with whom Perrier resided, told the police that Perrier bought a revolver on Saturday last. He told Crampton that a young lady had been ‘pulling his leg’ and that his French blood would ‘ get the better of him and he would shoot her ‘. Crampton took the revolver and cartridges from him, but Perrier, however, again got possession of them. Miss Jeffs is not seriously hurt. Miss Kate Jeffes, 21, the young woman who was shot in the arm and breast by a French Canadian, named Felix Perrier, in George-street on the night of June 21, died at the Sydney Hospital at 3.30 this morning from the effects of the wounds, accentuated by the shock. She was the daughter of Sergeant Jeffes, of No. 2 Police Station. Kate Jeffes, 21, the young woman who was shot in the arm and breast by Felix Perrier, a French Canadian in George-street near Goulburn-street, on the night of June 21 last, died at the Sydney Hospital early on Saturday morning from the effects of the wounds and the subsequent shock. She was the daughter of Sergeant Jeffes of No 2 Police Station. The wound in Miss Jeffes’s breast proved more serious than was at first believed but it was not anticipated that it would cause death. While in hospital, however, deceased suffered considerably from shock and was unable to sleep. On Wednesday and Thursday last she was in a low state but rallied on Friday morning. At 11 o’clock on Friday night she became worse and gradually sank, death taking place at about 3.30 a.m. on Saturday. SHOOTING OF MISS JEFFES. EVIDENCE AT THE INQUEST. VERDICT OF MURDER AND SUICIDE. Mr.. H. Hawkins, P.M., at the City Coroner’s Court yesterday, held an inquiry into the deaths of Felix Perrier, 35, a cook, and Catherine Margaret Jeffes, 21 a waitress, the principals in the tragedy on the night of June 21, when Perrier mortally wounded Miss Jeffes and afterwards took his own life by firing two shots into his head, in George-street, near Goulburn street, City. Edward Crampton, hairdresser and tobacconist, carrying on business in Druitt-street, City, said he had known Perrier for some time. He was a French-Canadian by birth, and a native of Montreal. Perrier came to lodge at his place on June 19, and told witness he was employed at a cafe in Pitt-street. Next day Perrier brought a revolver to the house, and witness asked him what he wanted it for. He replied, ‘I want to fight a duel.’ Witness, however, obtained the weapon. On June 21 Perrier asked. ; him for it, saying that the man he was going to fight with had disappeared, and he wanted to raise a few shillings on the gun. Witness gave it to him. Dr. Edmund Pauling said Perrier was dead when taken into Sydney Hospital. Miss Jeffes was admitted, a bullet having passed through the cartilage of the left arm, and one having entered the body below the right breast. She died on Thursday night last. Dr. Palmer, who made a post-mortem examination, said the cause of death was a bullet wound in the head. 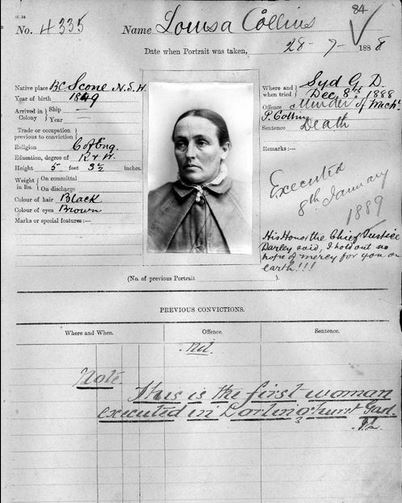 Maria Webber, living in Lewis-street, Redfern, said she was in George-street on the night of June 21. When near Goulburn-street she saw a man accost a girl, and say, ‘Good night.’ The girl did not take any notice, and the man put his hand to his hip pocket. He fired a revolver at the girl, and she screamed, and cried out, ‘My God!’ The man fired again, and the girl dropped to the ground insensible. Perrier then shot himself twice in the head, and dropped. Witness heard no quarrel. Sarah Williamson, a resident of Glebe, corroborated the previous witness’ evidence. Traffic Constable Wilson searched Perrier’s body at the Morgue. He found military discharge papers in one of the pockets. Eliza O’Connor, living at 32 Francis-street, Hyde Park, deposed she was outside Messrs. Anthony Hordern and Son’s business premises, George-street, about 9.30 on the night of June 21. Witness heard three revolver shots, and rushed round into Goulburn-street. A young woman was lying on the ground. She told witness she had been shot by a man, and asked to be taken home. Witness took her to Sydney Hospital. Senior-constable Leary had a conversation with Catherine Jeffes at Sydney Hospital on the night of June 21. She told him she went to work at the Glenrock Cafe, in Pitt-street, about four months ago. She stayed there for some time, and made the acquaintance of a man named Perrier, who was employed as a cook at the same place. They exchanged letters. She soon afterwards left the Pitt-street cafe, and went to one in King-street. Perrier pestered her there, and she had tried to avoid him. Mark Anthony Jeffes, uncle of the deceased girl, narrated a conversation he had had with his niece two days after the shooting. She told him that she did not want to have any thing to do with Perrier. The Coroner found that Catherine Jeffes was murdered by Felix Perrier, and that Perrier committed suicide.